This is the first of four posts covering facilitation games for the different phases of meetings: Check In, Opening, Exploring, Closing. The Check In is the initial phase of a meeting, and to a large extent is independent of the content. The purpose of this section is to bring everyone’s focus into the room and establish the collaboration boundaries, so that right from the start we are all clear on what we expect of each other, and what we expect from the session. For regular sessions like retrospectives with teams who know each other well, I jump straight to the Metaphor section below; for teams that are new to working together, or long facilitation sessions, I try to include all three steps as time allows. These activities signal the general level of attention, acknowledging outside distractions and bringing attention to the current objective. 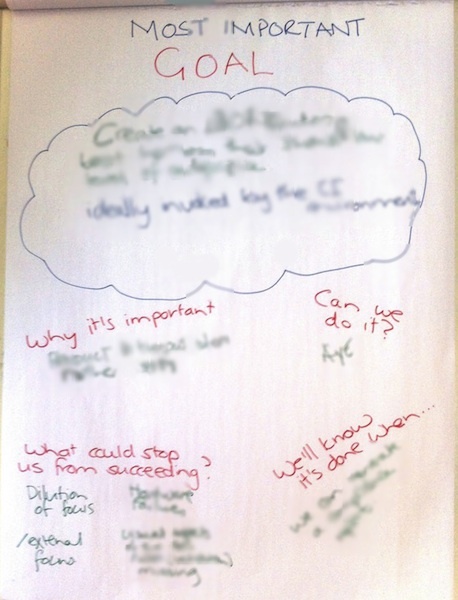 WIIFM – have participants write their “What’s In It For Me” (What I want to get out of this session) on a stickynote and stick it up on a designated wall space. If time allows, have them discuss this in small groups first. Revisit at the end of the session as part of closing. Defines personal objectives, generates ideas for others, and also gives the facilitator some perspective on the group’s expectations. These activities are designed to maximize collaboration. Developing personal connections between participants and setting the boundaries of the meeting help to establish initial trust. How can we make this (retrospective / session) fail? Round robin format – this is a fun way to surface fears and create awareness of unsupportive activities and attitudes, and agreement on how to avoid them or handle them if they come up. Once the conditions of safety have been established, a quick ‘Turn the Head’ activity suffices as a Check In, providing a meaningful transition to the Opening section of the meeting. It’s ‘disruptive’ as it challenges our thinking by bypassing the jargon we use on a daily basis, to create new associations and insights. Metaphor check-ins can also give a heads-up on underlying themes or tensions, but are quick enough to simply highlight issues without pre-empting a tangential conversation. These ideas appear in both Gamestorming and Agile Retrospectives. While there is always someone in the room who “can’t draw to save their lives,” I’ve never seen this exercise produce trivial insight. Both metaphor and drawing can create new neural networks that help to situate each participant’s experience; drawing goes further by using a different form of language and connecting different spheres of brain activity. The debrief experience tends to be rich, and contributes to building trust within the group. … and then sometimes I just ask for any 2 or 3 words, or a highlight and lowlight, that start the discussion. This is particularly useful when I don’t know the group, when emotions are running high, or there have been a variety new experiences. 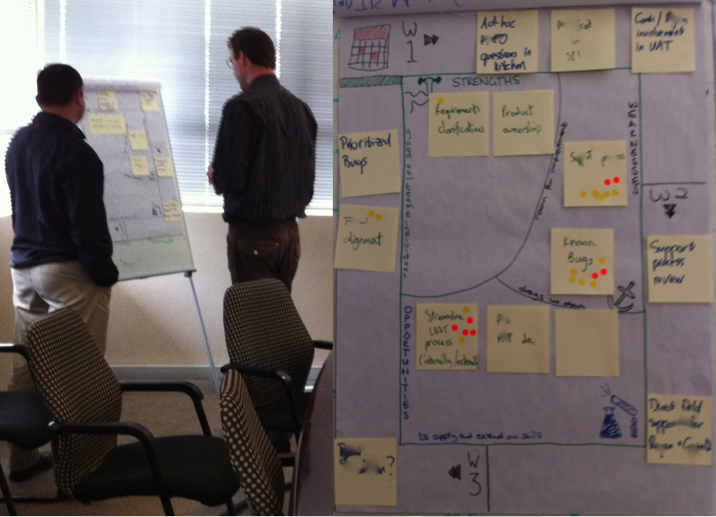 I’m often asked where to find facilitation games and formats for agile teams. Fortunately there’s an increasing amount of information on the web, a number excellent books on the topic and some great training courses available – and since it’s an ever-expanding world, the more you look the more you’ll find. Over time I’ve assembled a list of favourite collaboration games covering a wide variety of applications, which I’d like to share over the next few blogs. To make sense of them, it helps to understand a little bit about the activities we call Games. What is a Facilitation Game? The idea of games being inappropriate or irrelevant in a business context is fast losing ground as we begin to understand the value of collaborative and innovative approaches to problem solving. Empirical experience games are safe-to-fail learning activities that simulate real-world scenarios from which we gain deep experiential knowledge quickly, as opposed to theoretical knowledge. They have a powerful learning value which helps us act more consciously when we’re in similar situations in the real world – but many organizations still distrust their un-businesslike characteristics. Collaborative activities are called ‘games’ because they follow the game format of open – explore – close; the activities are interactive, with ‘set moves’ directed towards an overall goal, and an outcome which is determined as a result of the collaboration. Collaborative games tend to be easier to adopt in meeting agenda as they readily support business objectives, and while the level of collaboration may feel unusual at first, the quality of the interaction compared with traditional meetings quickly establishes their value. This is where the focus of the next few posts will be. We can apply the gaming ‘open – explore – close’ structure to designing the facilitation agenda as well. There are different kinds of activities for each part of the meeting, and following this format creates a balanced pace through the session to keep participants focused and engaged. ‘Turn The Head’ highlights the value of the disruptive element to adjust our viewpoint so that we can see our world through different lenses. I also use this overall structure for other sessions, with a greater emphasis on the specific area of focus, as well as icebreakers or empirical experience games as appropriate. I’ve learnt to start meetings with a discussion of the agenda and how long we’ll spend on each section, and keep this visible for the duration of the meeting. Initially I resisted the idea, with worries like “what if it goes wrong; what if people don’t like it, and I want to change direction?” but I’ve been amazed at how much collaboration improves when participants can see the overall context of each activity … and I’ve also learnt that changing direction with the full awareness of the group is far more effective than rigidly holding onto the plan or appearing unprepared when circumstances change. Developing a wide and deep toolkit gives us the flexibility we need as facilitators to respond to our changing circumstances. Each of us builds up a unique set that works for our environment, and which also evolves with time. * Links will become active as the posts are published.